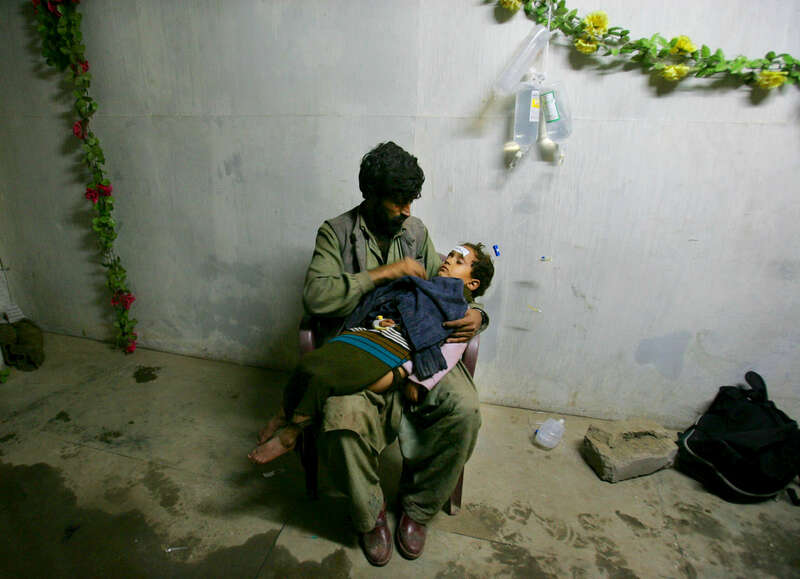 BALAKOT, PAKISTAN: A father holds his daughter awaiting medical treatment at a makeshift trauma facility where earthquake survivors were brought in by helicopter from remote villages. A devastating earthquake measuring 7.6 on the Richter scale hit northern Pakistan and neighboring India in early October leaving up to 3 million people homeless in Pakistan, killing almost 80,000 in Pakistan and another 1,400 in Indian-Kashmir. Rescue efforts were complicated by the remote mountainous landscape and the vast areas effected leaving the people in desperate situations. The injured were trapped for days with little food and no shelter as roads were blocked by landslides until helicopters were able to rescue the victims. Aid agencies could barely grasp the enormity of the natural disaster, the worst in Pakistan’s history.